As promised, here are some more articulation handouts! 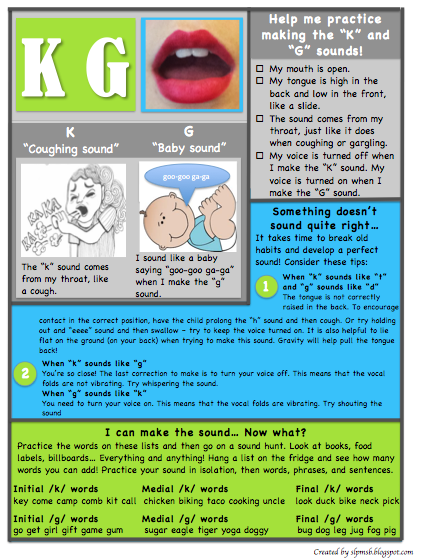 I condensed s/z and k/g to the same page since kiddos with one usually have difficulty with both. 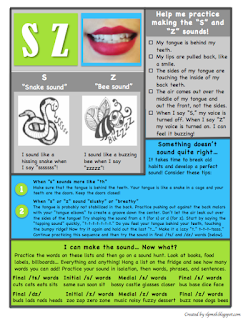 The s/z handout is included in a "later sounds" bundle and the k/g handout is included in a "middle sounds" bundle, both available on my TpT store for $4.00 or within the complete bundle for $10.00. I made the decision to charge for many of my materials due to the considerable amount of time spent designing custom art and creating them. However, please send me an email (speechlanguagecity@gmail.com) if cost is prohibitive - if you are unable to pay and I will work something out. Please let me know if you have any suggestions for improvements! These will be great for parent and teacher handouts. I really appreciate the photo for reference. Thanks so much! Thanks so much, this is very appreciated! No problem! Thanks for leaving a comment! These are great! I find that r is one of the hardest sounds to teach. Do you have a handout for /r/? love the photo that is included.....well thought out! thank you! !